I was never the most organized person growing up, toys everywhere, books and homework in various locations, but when it came to my closet, everything had to be meticulous. I have 2 younger sisters, to combat their thievery of my precious clothing I would color code the heck out of my small walk in closet, so I knew EXACTLY what was missing. Moving to NYC, I wish I had that small walk in closet. I currently have a perfectly average-small closet that you would typically find in the hallway of a home (lets face it, my apartment is basically a hallway). My closet masquerades itself as a walk-in, but upon moving in, I was very disappointed in its lack of space. I share 3 rods with my boyfriend, one full length rod to the right and 2 stacked on top of one another on the left, no easy task. The closet has very strict rules, only clothes; no suitcases, shoes, or jackets that take up tons of space. In the middle of the space, I decided to put a few plastic stacking drawers (http://www.amazon.com/Clear-Stacking-Drawer-X-Large-Single/dp/B0001IVPTQ/ref=wl_it_dp_o_pC_nS_nC?ie=UTF8&colid=3U7Z0DKRMH37A&coliid=I3L50BMWBGLA7A) my boyfriend moved in with (they were originally filled with years worth of paper work and other odds & ends). They were fine until I decided to maximize my space by putting a shelving unit on top of it, no bueno! I bought my 7-runner medium unit during the elfa sale, really expensive otherwise. If you fill out an Elfa design form on the Container Store website, they’ll occasionally send you coupons for Elfa products. I recommend watching the videos of how to put it together, their instructions are not very informative. Once I figured out the correct way to hold the unit, I was on fire. I was working so quickly, I accidentally installed one side upside-down. Panicked, I called Elfa’s customer service (at 9PM) and they told me to bang out the side with the hammer, my boyfriend was able to do it it 2 swings. I used a regular hammer and didn’t dent the unit. 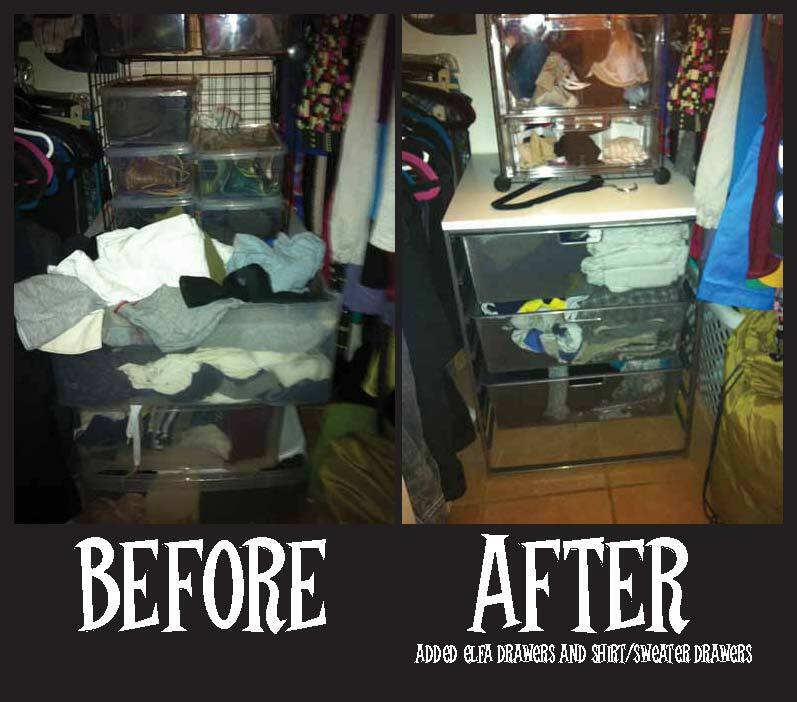 Initially, I bought three 2-runner drawers for my unit, thinking i could put a few pairs of shoes under it, not the best idea or use of space, I ended up getting a 1-runner drawer for the bottom and it can fit like 10 sweaters. Great use of space and holds a ton of stuff. Check back for my endless quest to fit as much as I can into my tiny closet!